I’ve been looking for a new laptop case for ages – my last one was a hideous black and orange neoprene number bought in a tearing hurry from Staples in New York before I caught a flight, but I haven’t been able to find anything that was both functional – no extraneous bells & whistles – and sleek enough to be carried without looking like my spiritual home is in Office Depot. There’s also a hell of a lot of pink and girl-y out there, and I really don’t feel the need to proclaim my supposed femininity across my tech accessories. (Do I really look like a Hello Kitty person?) Price point is important too – there’s not much kicking around in the mid-market. Anyway, I’m very, very much liking these Marshall Bergman bags (which are exclusive to Apple) A LOT. They have just the right amount of padding for a f**kwit like me who drops her bags for no reason, but not so much that they take up too much room in my carry-on on a plane. 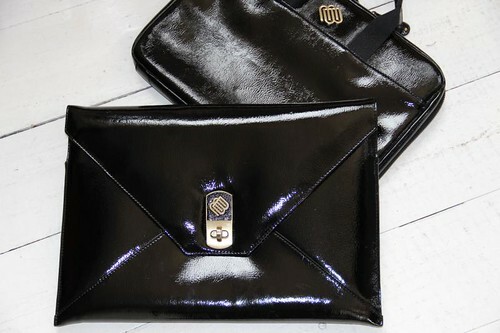 I took the black patent folio to New York, and loved its sleek look as I zoomed around the city for meetings. 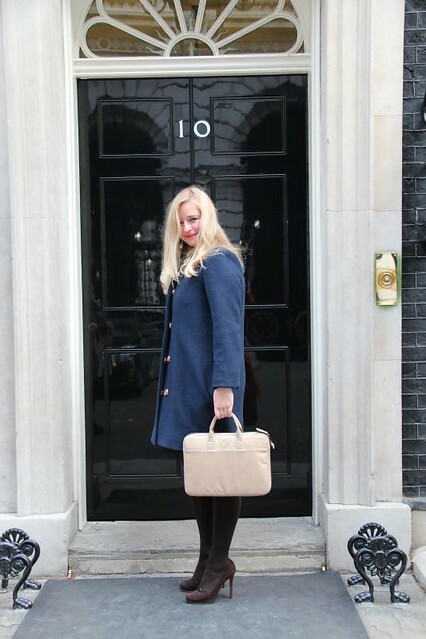 The Envelope masquerades a a large clutch bag, and you could totally get away with toting it around in the evening and people not even realising a laptop was hiding inside. (Altho, granted, I have a Mac Air, which is about as slim as a 13″ laptop gets.) The only thing I don’t like is the logo, which seems kind of clunky/retro in a not good way, but that’s a minor personal taste thing. *Co-founder Suzi Bergman’s great grandmother Sarah Bergman founded her workshop in Ludwigshafen Germany in 1890. A maker of utilitarian bags, Bergman foresaw a need for a functional bag that carried household grocery items and tools. Two generations later, Melanie Marshall and Suzi Bergman founded Storksak, stylish, functional baby bags for parents. Following the global success of the Storksak concept, (with bags now being available in over 30 countries worldwide), Suzi and Melanie spotted a gap in the market for an innovative new work bag brand, and launched Marshall Bergman. Wellies: The Carnaby wellington boot by Hunter. Oh, wow, what a marvellous shot. You look absolutely THRILLED to be there – don’t blame you. So what was your meeting with the Prime Minister for? Sorry I meant Samantha Cameron. I love the whole outfit but I too would love to know where the shoes are from…? Loving that coat – stunning colour. Where’s it from? @Elly: Hey there, I’ve just checked for everyone who wanted to know re the coat. It’s actually in the sale at Jaeger right now! It’s available in all sizes in blue and a lovely bright pink.